LOUISVILLE, Ky. March 26, 2014 – Walmart showcased its futuristic truck today at the Mid-America Trucking Show (MATS) in Louisville, Ky. 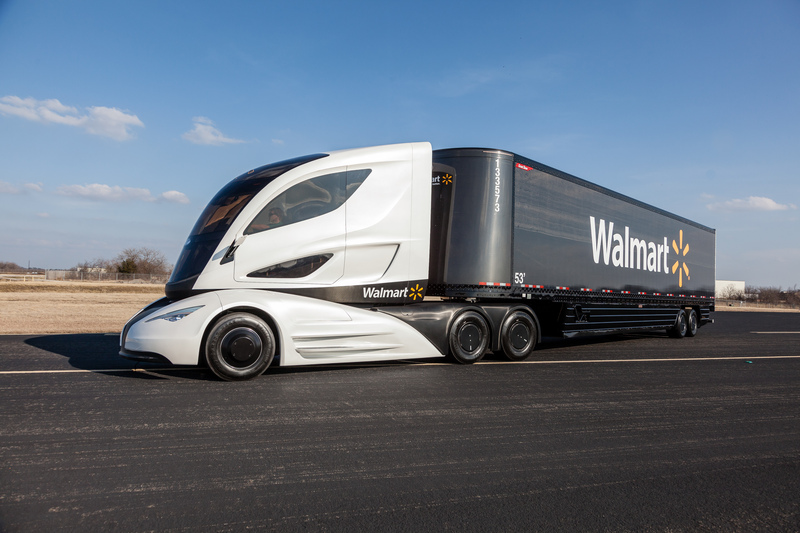 The Walmart Advanced Vehicle Experience is a tractor-trailer combination that features leading edge aerodynamics, an advanced turbine-powered range extending series hybrid powertrain, electrified auxiliary components, and sophisticated control systems all in one package, developed in support of the company’s industry-leading sustainability program. In 2005, Walmart, one of the nation’s largest private fleet operators, announced its goal to double fleet efficiency by 2015. Walmart trucks log millions of miles every year, so when it comes to sustainability and fleet efficiency, the goal is simple: deliver more merchandise while driving fewer miles on the most efficient equipment. As of last year, the company had achieved an 84 percent improvement in fleet efficiency over its 2005 baseline. Innovation is key to improvement, and the project aims to demonstrate a wide range of cutting edge technologies and designs Walmart is considering in an effort to improve the overall fuel efficiency of its fleet and lower the company’s carbon footprint. Although the prototype currently runs on diesel, its turbine is fuel neutral and can run on compressed or liquid natural gas, biofuels or other fuels. The prototype is the result of collaboration between Walmart and many vendors, including Peterbilt, Roush Engineering, Great Dane Trailers and Capstone Turbine. Almost every component on this vehicle is cutting edge and showcases innovations of the future that will drive increased efficiencies. Tractor: Walmart and Peterbilt have collaborated on aerodynamic, hybrid, electrification and alternative fuel projects in the past, each with incremental gains in fuel efficiency and emission reductions. The Walmart Advanced Vehicle Experience tractor combines many of these projects in a single vehicle. Aerodynamics: Designers used extensive computational fluid dynamics (CFD) analysis to optimize the truck’s styling. The truck’s shape represents a 20 percent reduction in aerodynamic drag over Walmart’s current Peterbilt Model 386. By placing the cab over the engine, the truck’s wheelbase is greatly shortened, resulting in reduced weight and better maneuverability. Walmart relied on product development supplier Roush Engineering to carry out the vehicle’s construction with these detailed design specifications. Range Extending Series Hybrid: Range extending hybrids are a synergy between electric trucks and series hybrids, and their design reduces the energy storage size required for trucks to run on batteries alone. With Walmart Distribution Centers now located closer to metropolitan areas, transport vehicles have shorter transit times to their delivery destinations. These shorter trips reduce the vehicles’ average trip speed and create more opportunities to recover energy through regenerative braking. The generator and energy storage on the truck are scalable based on the range desired. Turbine Power: The truck features a microturbine Range Extender generator developed by Capstone Turbine Corporation. The company also engineered the truck’s integrated hybrid drivetrain solution. The use of a hybrid powertrain allows the turbine to remain at optimum operating revolutions per minute (RPM), while the electric motor/energy storage handles acceleration and deceleration. A longer-range version of this powertrain would feature a larger turbine and smaller energy storage system. Fuel Neutral Capability: Turbines by their nature are fuel neutral and produce very low emissions without the need for aftertreatment. Turbines are also appealing because of their few moving parts, low maintenance requirements and lighter weight. Component Electrification: With automobiles moving to electrified accessories such as power steering and air conditioning, this truck scales those systems up for use on a larger vehicle. These electrified components are used only when needed and at peak efficiency. Charge Mode: When keyed on, the truck automatically detects the state of charge of the batteries and starts charging them, if needed, using the turbine engine. Charge mode can be manually selected if an operator wishes to “top off” the batteries prior to shutting down. Electric Vehicle Mode: For use in urban areas, the truck will run on electric power alone until the battery state of charge hits 50 percent. At that time the turbine will automatically start and begin charging the batteries. Hybrid Electric Mode: For maximum range, this mode runs the turbine continuously, only shutting down if the batteries run out. Trailer: The vehicle’s trailer, manufactured by Great Dane Trailers, offers a host of fuel-saving features. The trailer body is built almost exclusively with carbon fiber, including one-piece carbon fiber panels for the roof and sidewalls, saving nearly 4,000 pounds when compared to traditional designs. The trailer’s convex nose also enhances aerodynamics while maintaining storage space inside the trailer. Other special features of the trailer include special low-amperage LED lighting strips, composite trailer skirts, aerodynamic disc wheel coverings, a Posi-lift suspension, and a one-piece, fiberglass-reinforced floor panel with a 16,000 pound forklift rating. A number of vendor partners were involved in the design and creation of the Walmart Advanced Vehicle Experience. Key partners – in addition to Peterbilt Motors Company, Roush Engineering, Capstone Turbine Corporation and Great Dane Trailers – include Qualnetics Corporation, Allison Transmission, Transpower, New Eagle, Fiber-Tech Industries, Grote Industries, Inc., Laydon Composites Ltd., Isringhauser Seats, Graykon, LLC, Dometic Corp, RealWheels Corp, Corvus Energy, Parker Hannifin, Accuride, Milliken Chemical, SAF-HOLLAND USA, Inc. and Whiting. For more information and to access related photos and videos, please visit http://corporate.walmart.com/truck. Wal-Mart Stores, Inc. (NYSE: WMT) helps people around the world save money and live better – anytime and anywhere – in retail stores, online, and through their mobile devices. Each week, more than 245 million customers and members visit our 11,302 stores under 71 banners in 27 countries and ecommerce websites in 10 countries. With fiscal year 2014 sales of over $473 billion, Walmart employs more than 2 million associates worldwide. Walmart continues to be a leader in sustainability, corporate philanthropy and employment opportunity. Additional information about Walmart can be found by visiting http://corporate.walmart.com on Facebook at http://facebook.com/walmart and on Twitter at http://twitter.com/walmart. Online merchandise sales are available at http://www.walmart.com and http://www.samsclub.com.